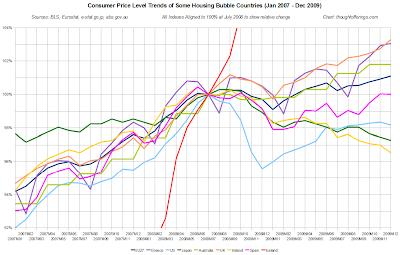 Given how much it has been in the news lately, I have added Greece to the price level graph. 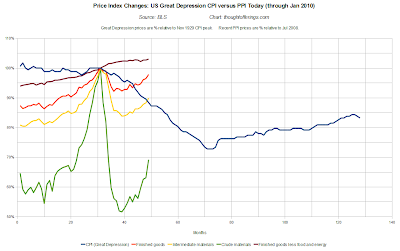 However, I excluded Greece from the three month trend graphs below because it is so seasonally volatile (and the European Harmonized Indexes of Consumer Prices don't seem to offer seasonally adjusted series). 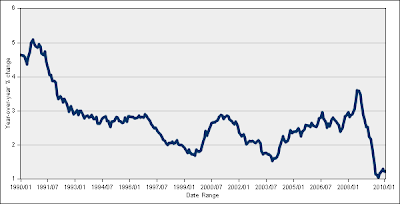 Nevertheless, as you can see in the absolute price level graph above, overall prices are roughly 3% higher than in July 2008 when global commodity prices peaked. This is near the high end of the countries I've included (excluding Iceland which is a dramatic outlier). 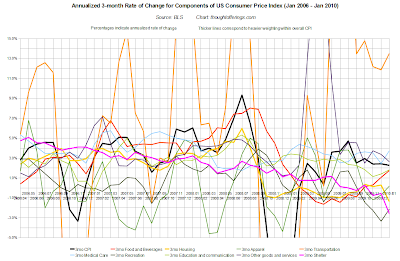 A quick look at one summary of Greece's CPI suggests fuel prices for transportation and heating have been a big part of the increase in 2009, but it appears that other prices have been rising too. 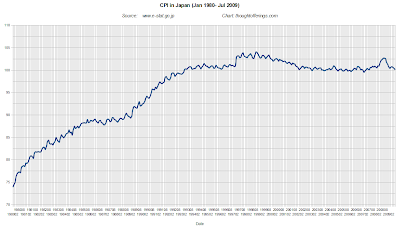 Japan and Ireland are the only countries showing significant deflation at present. 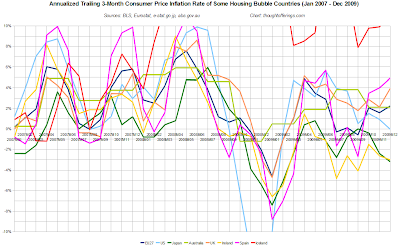 Note that different countries construct their CPI measures differently, so some trend differences likely reflect what each country considers a representative "basket" of goods and services, though the European data is all drawn from Harmonized Indexes of Consumer Prices. 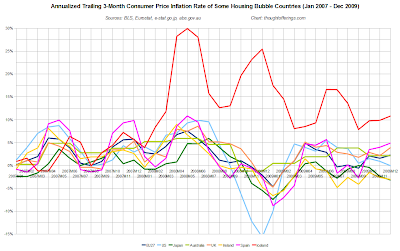 Also the US, UK, Ireland, Spain, Iceland, and Euro 27 price levels are not seasonally adjusted. 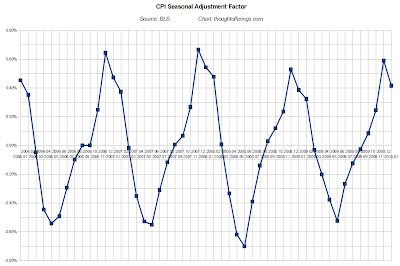 I think Japan's and Australia's are seasonally adjusted, but am not certain. 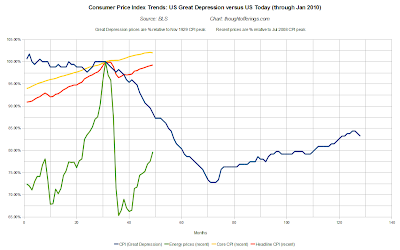 Looking at absolute price level charts rather than just rate of change (typically year-over-year) seems especially valuable when price levels are not moving in a single direction (until the recent deflationary trends, the direction of CPI indexes was primarily up).